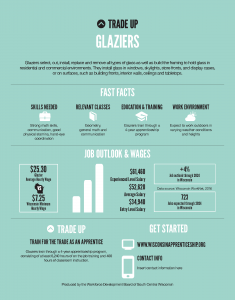 We introduced the Trade Up campaign in 2013 as a way to raise awareness for students, parents and educators about careers in the construction sector. The campaign was an incredible success, reaching thousands of students, parents and community members through the use of informative banners and talks given by industry leaders. 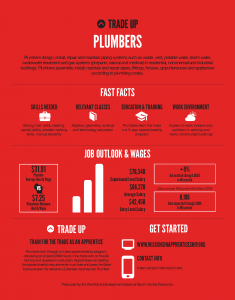 The campaign provided information and statistics regarding job growth, wages, skills or education required and available opportunities for apprenticeships in the construction trades, which include: electricians, sheet metal workers, steamfitters, painters and finishers, plumbers, laborers, bricklayers, ironworkers, glaziers, carpenters, and operating engineers amongst other trades available. In this video, Nancy Everson of the Sun Prairie School District talks about how the Trade Up program was started and implemented, as well as the positive role she sees it playing in the Sun Prairie community. 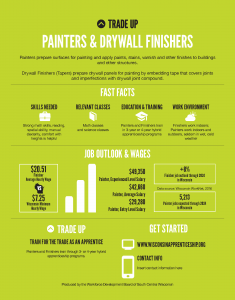 Help us spread the word about career pathways in the trades! Banners, posters and handouts are available for download as Adobe InDesign files for each of the following trades listed.